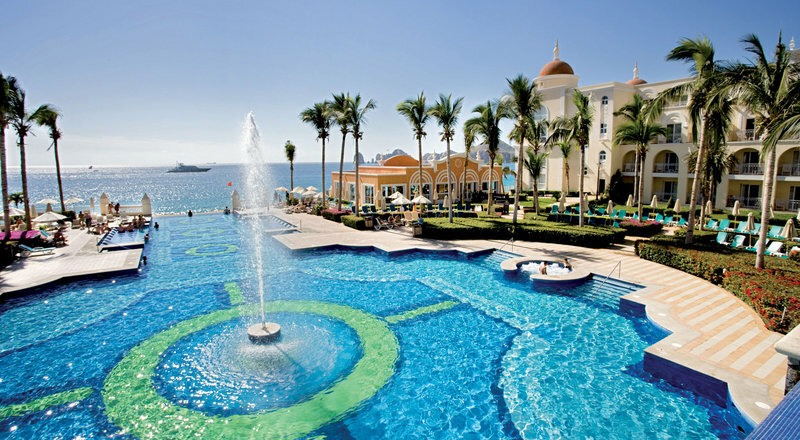 In Cabo San Lucas, Mexico, we find this magnificent beachfront property, the Hotel Riu Palace Cabo San Lucas. It is surrounded by splendid gardens with beautiful views of the beach, and luxurious service for guests to enjoy during their stay. This Palace, with its relaxing atmosphere, offers the best way to regain strength and escape from the hustle and bustle of the city. It includes two fresh water infinity swimming pools, two children’s pool, a Jacuzzi, solarium terrace, gym, sauna and the “Renova Spa” wellness center with a range of different beauty treatments and massages to pamper your body. You will also find numerous activities to enjoy during your stay. You can go diving, play volleyball, and participate in the many water sports at the beach. At night you mustn’t miss the different shows and live music organized for you by our staff. If you still have energy and want to go dancing we invite you to the “Pacha” club where our DJs play your favorite tunes. Your children will have the opportunity to meet other children in the Riu Land program, where crafts and sports are just some of the leisure activities arranged by our entertainers. Thanks to the All Inclusive system you can enjoy Mexican cuisine at its best. It includes a wide variety of recipes and is recognized for its distinctive and sophisticated flavors which incorporate many spices, which is why 5 restaurants, the buffet restaurant and the different themed restaurants, Krystal” Fusion restaurant, “Misaki” Japanese restaurant (without reservation), “Mar de Cortés” grill and steakhouse, “San José” Mexican Restaurant (buffet starters and dessert), of the hotel offer the best menus and made to order dishes. Five bars, two swim-up bars, pool area beverage service will keep you happy. The Palace has 642 junior suites and suites. All are split-level with separate sitting area with a fully stocked mini-bar, liquor dispenser, safe, balcony or terrace, 24 hour room service.